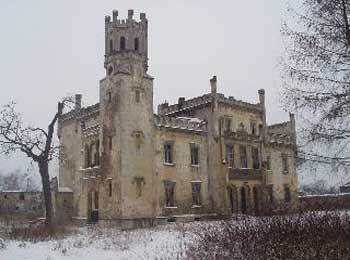 During the times of the Polish empire and even the 125 years before the First World War when the Polish state did not exist, there was a large aristocracy that built country palaces. This elite also had residencies in a major city or town but, similar to France, these were large lateral apartments rather than town houses. This means pre-war houses tend to fall into two types: Very big (Palaces) and normal (2-4 room wood built houses). There are some exceptions to this and in towns such as Zacopane and Nałęców stunning examples of town houses still exist but they are the exception rather than the norm. After the Second World War brick built houses became more popular and led to a distinctive style during the sixties and seventies. 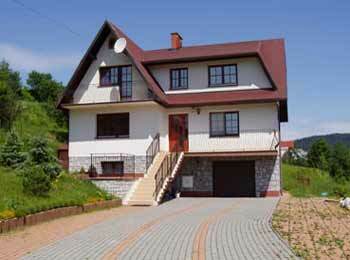 These are houses which can generally be defined as useable all year round. The pre war wood built house is usually a one storey bungalow. It will have a kitchen with a wood or coal burning stove that will also provide heat to the rest of the property. The windows are not double glazed but are of the traditional construction. There is one window on the inside of the property opening inwards and one on the outside opening outwards. These provide a form of double glazing. Some of these houses have been modernised to add internal bathrooms but most do not have this facility and so although they were once inhabited 12 months of the year many are now regarded as recreational houses suitable for weekend and summer use. 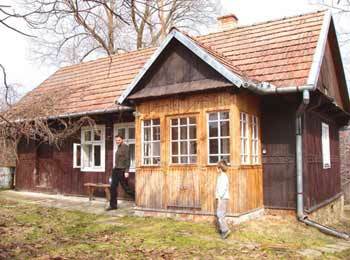 After World War Two a growing middle class emerged in Poland and brick built houses became popular. These are generally constructed out of large ceramic bricks (for good insulation) and the outside is then plastered over and painted. Their layouts are broadly similar. There is a lower ground floor which is half below ground level and usually has small windows. Here there are storage rooms, sometimes a garage and often a second "Summer" Kitchen". The lower ground floor then was used for drying meat, storing vegetables, etc and acting as a useful insulation level. In modern times they have proved just as useful. Many have their own external door and so have become offices for small business. On the raised ground floor are the reception room, main kitchen, bathroom and bedrooms. These may not be the most picturesque of houses but the majority are solid, well built and extremely practical. The houses above often have a second and third storey. These can contain the expected bedrooms and bathrooms but many also have a kitchen on each floor. The reason is that a number of these houses were designed by their owners as "Two or Three Family Houses". From the late 1980s on houses were built to impress! In the late 1970s and 1980s there was a property boom fuelled by loans from Russia. In the 1990s and now this continues and the trend has been away from practicallity and in to "impressing the neighbours". Well almost. The lower ground floor layout has remained in most houses providing garage space, storage areas, games rooms, saunas and more. As before these often have their own front door and so they can easily be converted into offices. 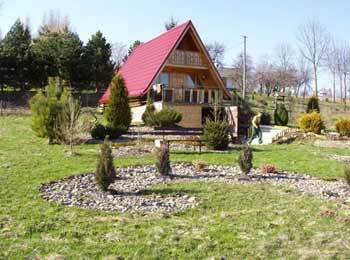 The result is that most modern Polish houses are excellent both for living in and running a business. The raised ground floor now houses the kitchen (usually the only one), reception room with doors leading out onto a terrace and down to the garden, a bathroom and perhaps a bedroom or office. Upstairs are the expected bedrooms and bathroom(s). The style now is grandeur. Not square houses but ones with contours and definition, large entrance halls, sweeping reception rooms, heavily decorated bathrooms with corner "hydromassage" tubs and so much more! In an effort to build bigger and better than their neighbours some properties have become disproportinate to the land they are on leaving the owner with a large house surrounded by a very small garden. It is always worth checking the land size no matter how beautiful the house. These are houses which have been built for use in the summer or at weekends. As such they are not usually insulated to the same extent as residential houses and some do not have double glazing. 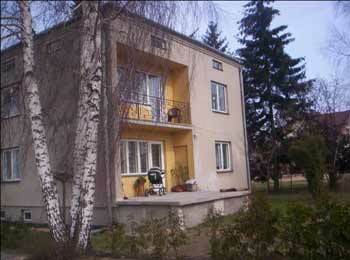 This type of house is a growing trend amoung Poles. More and more wealth has allowed them to buy a second plot of land, perhaps near a lake, forest or the sea, that they can use during the exceptionally hot summers. Some are brick built but the majority have been constructed from wood. They have a kitchennete, reception room and (usually in the attic) a couple of bedrooms. The majority do have bathrooms or at least a toilet and shower but this is not always the case. But with such hot summers many have an outside toilet and shower these are a popular option, not a downside. These properties can either be found scattered across the countryside or in complexes of all sizes ranging from four or five to hundreds. The more isolated tend to be more peaceful while the ones in complexes usually have better aminities nearby like bars, restuarants and shops. 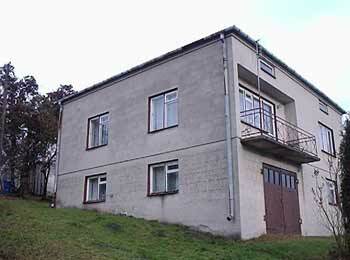 As mentioned earlier many of the pre-war houses are now sold has recreational houses. As with almost all European countries Poland had a large and wealthy aristocracy who built palaces of all shapes and sizes from 10 to 100 rooms. During socialist times many of these were confiscated by the authorities and fell into disrepair. Hence now you will find a large number of these properties are not being sold by individuals or agents, but by government bodies. Some have already been renovated while others require significant investment. Their main use today is seen as hotels, conference centres, etc. although private individuals looking for a large residency have snapped up a large number already.